The M-Class SUV might be the Swiss Army Knife in the Mercedes-Benz lineup. It isn’t so large that it’s cumbersome or hard to park, but it comfortably seats five and carries plenty of stuff. As daily transportation, it doesn’t feel like a truck, and it won’t beat its driver or passengers up. Yet it has the potential for some fairly serious off-road adventuring, and it can tow up to 5,000 pounds. The M-Class is more than powerful enough in any of its variations, with the safety equipment, luxury accoutrements, style and smooth finish expected of a Mercedes-Benz. For 2007, the M-Class line features two new, very different models that will further broaden its appeal: The fuel-efficient ML320 CDI diesel and the ultra-high performance ML63 AMG. With the ML320 CDI, you can forget just about everything bad you knew about diesels. It gives up nothing to the standard, gasoline-powered ML350. It’s equipped identically, except for its diesel engine. The 3.2-liter diesel V6 generates 398 pound-feet of torque, comparable to a large-displacement V8, and brings a substantial improvement in fuel economy. The ML63 AMG features a hand-built V8 that generates 503 horsepower with AMG tuning and enhancements to match all that power. Though considerably more expensive than other M-Class models, the ML63 AMG is a true high-performance machine. Its 6.2-liter V8 is hand-built by a single technician. It bursts from 0 to 60 mph in 4.8 seconds, according to Mercedes, with top speed electronically limited at 155 mph. Plus, it comes with the full load of luxury features. The original M-Class helped make luxury SUVs a familiar part of the automotive landscape. Completely redesigned for the 2006 model year, this second-generation M-Class is better than the original in every way. It’s roomier, more comfortable and more car-like in its bearing. Its wheelbase is almost four inches longer, and its body three inches wider, all to better accommodate larger Americans inside. In the bargain, the coefficient of drag, or Cd number, has dropped from brick-grade to a sylphlike 0.34, on par with many passenger cars that are much lower to the ground. This means quieter highway travel and better fuel economy. In place of the original body-on-frame, truck-style design, this latest-generation M-Class has welded unibody construction with isolated front and rear subframes, a technique that emphasizes rigidity, decreased vibration and lower weight. The unibody also reduces its overall height, making it easier for families to get in and out. The M-Class has given up any pretense to being a large-family vehicle. The optional side-facing rear seats from the old model are gone (they weren’t very good anyway), so the M-Class is strictly a five-seater. You’ll want to look at the GL-Class for seven-seat SUV accommodations. The new look and larger size come with a new double-wishbone front suspension and four-link independent rear suspension, emphasizing sedan-style dynamics. Yet with a two-range transfer case on most models, and a sophisticated control program for the fulltime all-wheel-drive, the M-Class can get its driver through some fairly tricky off-road situations. M-Class buyers will pay a premium over many other comparably equipped luxury SUVs, but those who appreciate the cache and engineering strengths of the Mercedes brand will find plenty to like here. New for 2007 are three significant options: A dual-screen rear-seat DVD entertainment system, a rearview camera that shows the area behind the vehicle when reverse is engaged, and a Bluetooth interface for cell phones that provides integrated, hands-free operation without docking the handset. 2007 brings two new models that expand the Mercedes M-Class line to four. Each is equipped with a seven-speed automatic transmission and electronically managed 4ETS fulltime all-wheel drive. The primary distinguishing feature is each model’s engine. The ML350 ($42,680) is powered by Mercedes’ latest-generation 3.5-liter gasoline V6, generating 268 horsepower. It comes with vinyl upholstery, automatic headlights, power seats, and an eight-speaker stereo with CD. 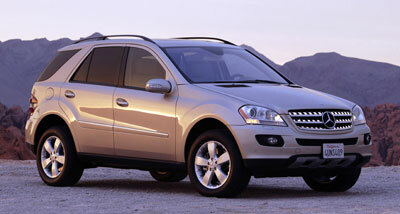 The ML320CDI ($43,680) is equipped similarly but with the 215-hp 3.2-liter diesel V6 rated at 398 pound-feet of torque. The ML500 ($49,200) gets a three-valve, twin-spark 302-hp V8 and more standard features. These include heated, leather covered front seats, rain-sensing wipers and Tele-Aid emergency communication. The ML500 also includes more potent brakes and an upgrade from 17-inch to 18-inch alloy wheels. The ML63 AMG ($85,500) features a 6.2-liter V8 that generates 503 hp along with an AMG transmission, AMG shocks and suspension tuning, high-performance P295/40ZR20 tires on 20-inch wheels, AMG brakes, an air dam and other aerodynamic aids, AMG instruments, harman/kardon Logic7 CD6 audio with 12 speakers, and leather upholstery. Options include Distronic radar-managed cruise control ($3,150), Parktronic obstacle warning ($760), the DVD-based navigation system ($1,650), dual-screen rear-seat DVD entertainment system ($2,800), Keyless Go starting ($1,100), iPod integration kit ($365), CD6 changer ($440). Three packages are available, designated Premium I ($2,800), PII ($5,800), and PIII ($8,600), with exact content tied to the model. Drivers who want the racy look and sportier handling of the ML63 AMG, but not the high-power engine, can order the AMG Sport Package ($4,550) on any M-Class model. Safety features on all models includes two-stage front airbags for the driver and front passenger, side-impact airbags front and rear (torso protection) and curtain-style head protection airbags. A rollover sensor can activate both the seat-belt tensioners and curtain airbags if the vehicle senses an imminent rollover. An Electronic Stability Program comes standard along with advanced anti-lock brakes with electronic brake-force distribution. A tire pressure warning system is also standard. The 2007 Mercedes-Benz M-Class generates more physical and visceral excitement than its predecessors, the pre-2006 models. From the emotional perspective, its front end is bolder, more interesting and more aggressive, with ventilated grille bars, a power-dome hood design and wild-looking integrated headlamps. In profile, the wheel arches loom large and prominent. There's an unmistakable character line rising front to rear, and a forward-slanting C-pillar that frames trapezoidal rear side glass. On the practical side, the M-Class body is much more aerodynamic. Its drag coefficient, or Cd, measures 0.34. That's closer to the average sedan than the typical slab-sided SUV. The lower the number, the less noise generated as air flows over the vehicle, and the less power required to move the ML at a given speed. Some improvements aren't readily apparent to the eye. A new-fangled scratch resistant paint, embedded with thousands of flecks of ceramic, is standard. It should be welcomed by those owners who actually decide to challenge overgrown trails, or those who share their garages with kids, toys and bicycles. There's an optional power liftgate operated with the key fob, and several cargo organizing devices available as accessories. New for 2007 is the ML63 AMG, and it is readily distinguished from other M-Class models. If its 20-inch spoke rims aren't a dead giveaway, check the ML63's more aggressive front and rear aprons, unique grille, flared fenders and deeply sculpted AMG side skirts. The ML63 also features unique tinted taillights and two sets of twin-chrome exhaust tips. Inside the Mercedes-Benz M-Class, the dashboard, door panels and seats compliment the aggressive exterior design nicely. Wood, leather, plastic and metal finishes are generally top-drawer, as they should be at this price. Four huge, round air vents spread across the dash panel, which is dominated by a deeply hooded instrument cluster with sharp graphics and prominent chrome trim around the tachometer and speedometer. A central information window between the gauges can be programmed to supply about as much driving and maintenance information as one driver can stand to absorb. The steering wheel has a nice, thick rim that's reassuring when driving off road. We're fond of the optional wheel, finished with the top half in wood and the bottom half in leather. The center hub houses four sets of controls for information, telephone, navigation and entertainment systems. Wipers are stalk-mounted to the left of the column, while primary climate and audio controls are in the center stack above the console. The center stack is dominated by the elements of the COMAND system and a 16:9 LCD display which incorporates entertainment, telephone, and navigation displays. The M-Class features an electronic gear selector that's making its way into all Mercedes models. It's an easy-to-reach short stalk on the right side of the steering column, with simple up-down movement for reverse and drive. Alternate shift buttons, which allow selection of a specific gear, are located on the back of the steering wheel hub, right where fingers wrap around the spokes. It's a good system, and eliminates the conventional gear selector from the center console, making more room available for elegant design and function. The power seat controls have been relocated from the door to the outboard side of the seat bottom. We can fathom no reason for this change except the cost trimmed by eliminating the remote switches. It's certainly a less convenient arrangement. Still, the front seats themselves (even the base seats in the ML350) are all-day comfortable. The rear seat isn't as supportive as the fronts, but it's much roomier than before. Most of the newly created space in this second-generation M-Class translates into more knee and legroom for rear seat passengers. The rear seat folds fairly easily, and is split 60/40, to expand storage space from 29.1 to 72.4 cubic feet maximum. The load height in back is SUV high, but M-Class offers nearly as much cargo-hauling room as the typical, full-size truck-based SUV. The new 2007 ML63 AMG has heavily bolstered sport seats upholstered with Nappa leather and an Alcantara insert across the shoulder bolsters. Its entire dashboard is wrapped with leather. The ML63 also features a leather-wrapped sport steering wheel, unique instruments with AMG graphics and stainless-steel pedals with rubber studs. In any variant, the Mercedes M-Class will do just about anything the typical owner demands, on road or off. Acceleration ranges from better-than-adequate, even with the new diesel engine, to oh-my-gosh! with the new ML63 AMG. Ride quality on pavement is never rough, even in the more stiffly suspended ML63, which features Mercedes' automatic AirMatic air suspension as standard equipment. New for 2007 is the available 3.2-liter diesel V6. This is the state of the art in diesel engines and we really like it. It's as clean as the ML's gasoline engines and gets much better fuel economy, yet it is not available in California and four other states. With this engine, there is no black soot, no sulfur smell and no loud, clattering noise. At idle the diesel in the ML320 CDI is nearly as quiet as the gasoline engine in the ML350, and that's when you're standing outside next to the vehicle. Inside, a driver is hard pressed to tell any difference between the gas and diesel engines, measured by noise or vibration. The only obvious difference is that the diesel shifts to a higher gear under full-throttle acceleration sooner than the gas engine to take advantage of its torque. There's no decrease in performance, either. Mercedes reports identical 0-60 mph times of 7.9 seconds for the both the ML320 diesel and the ML350. Yet that doesn't tell the whole story, because in short bursts the diesel actually accelerates more quickly. Its whopping 398 pound-feet of torque (compared to 258 lb-ft for the ML350) comes across as a neck-whipping burst of acceleration. And for this the diesel buyer gets a fuel economy improvement of 30 percent or more in real-world driving. We're perfectly happen in the ML350, but if diesel were readily available on our appointed rounds, we would choose the ML320 CDI over the ML350. During several days of hard driving in the south of France, we found the ML500 a hoot. The 5.0-liter V8 engine will take this 2.5-ton SUV from 0-60 mph in less than seven seconds flat, and then settles down to a background burble by the time you reach seventh-gear overdrive. The seven-speed automatic offers a manual-shift mode, and it's the best automatic Mercedes has built. It's flexible, in that it kicks down to a lower gear more quickly than its predecessors, and it almost always keeps the engine in the most productive part of its power band. Yet its overdrive top gear makes for quiet high-speed cruising and better fuel economy. The suspension is good at keeping the ML nice and flat in high-speed corners, and it smoothes dips and potholes better than we'd expect a truck to do. The optional AirMatic suspension we tested in France can be downright supple, which trucks aren't supposed to be. The larger standard 18-inch wheels and tires with the 5.0 V8 and the power rack-and-pinion steering deliver a nice feel of the road, and quick reactions when necessary. At high speeds through mountain passes, the ML500 leans over a little, takes a set, and then grabs the ground and turns the corners. Critics have complained with some justification about the electronically actuated and modulated Sensotronic brake system that Mercedes-Benz has been feeding gradually into all of its models over the last few years. We're getting used to them, and they'll stop the M-Class right now without much pedal effort. They've also improved considerably since they were first introduced. Yet they still don't have the smooth, linear feel of the best mechanically actuated brake systems. Nice smooth stops can be tricky without practice. We prefer the brakes in the Mercedes cars that do not have Sensotronic. The Mercedes-Benz M-Class offers a nice balance. It's not as stiff and unforgiving as some SUVs, nor as mushy on and off road as others. It has reasonable off-road capability and good towing capacity, but it's never a chore to drive during the more mundane daily tasks most drivers will undertake. Its choice of four engines is a plus, allowing owners to tailor priorities from high mileage to high performance. NewCarTestDrive.com contributor Jim McCraw filed this report from Provence, France. Head/hip/leg room, f: 39.9/59.8/42.2 in. Head/hip/leg room, r: 39.8/59.8/40.0 in. Cargo volume: 72.4 cu. ft.